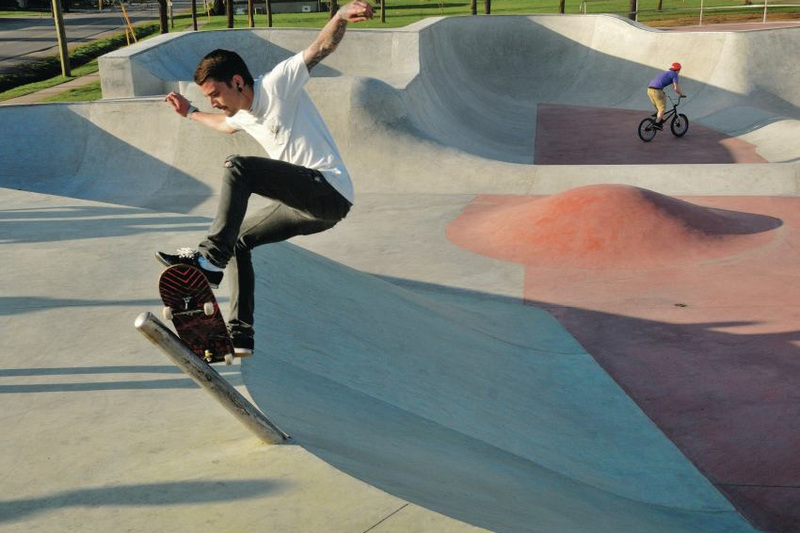 Skaters and bikers enjoy the smooth finishes of nautical-themed Algoport Skate & BMX Park in Port Colborne, Ontario. Port Colborne, Ontario’s public skate park, resembles a ship passing under a bridge. Its name memorializes a ship that sank in 2009. Custom integral colors match the corporate colors of the sunken ship’s owner—red flat areas are accented by green ramps and adjacent flat paving. Flatness tolerance is 1/8 inch in 9.8 feet. Toronto-based Patterned Concrete® Ontario Inc. performed the concrete work, which included installing 6,456 square feet of reinforced concrete paving, and shotcreting 3,660 square feet of concrete ramps and transitions between flat and inclined surfaces. The contractor also installed a sewer and drainage system and embedded stainless-steel components (copings, rails) into the cast-in-place concrete elements. For the ramps, concrete finishers and an ACI-certified technician applied the low-slump shotcrete, a high powder-small stone mix that allows vertical placement. Microfibers resisted plastic shrinkage cracks and and rebar was installed on 16-inch centers for maximum stabilization. The ramps were then screeded and troweled. Behind all copings, the crew applied Surfhard densifier by Euclid Chemical Co. An anti-graffiti company applied a sodium-silicate-based sealant to ward off graffiti and minimize deterioration. They cleaned the concrete, flooded the surface with the sealer, and repeated the process two more times to ensure full coverage. To create the peaked front of the boat, the contractor cast stainless steel components into the concrete wall, following the shape and contours within ¼ inch. A 5.9-inch-diameter pole was cast into the tip and face. The compass is a dish-like slab that follows the shape of the bank. The water-colored mogul, or bumpy slope, represents a wave surging along a boat. A 10.8-foot-deep “vert” ramp and landing pad simulates the stern of the boat, and includes an elevated quarter pipe (concave ramp) atop an adjacent 6.5-foot-tall ramp. The concrete banks are connected, transitioning along its 3,659-square-foot area 11 times. Not only does the radius of the wraparound ramp change, but its overall rise and run also changes. At every change a connecting panel, or blend panel, between the two changes had to be hand-shaped and shotcreted. Surfaces must remain smooth for skateboard wheels, so the contractor opted for filled sawcuts on flat areas and cold joints on inclined surfaces. The crew used a hopscotch method of skipping every other panel while pouring concrete. In this way, the first batches of concrete began to set and shrink before the next batches were added. Cold joints are usually problems to avoid. “But because the concrete is so tightly knitted by rebar, there’s no room for water to intrude and any cracks that appear won’t matter,” says Dino D’Ambrosio, chief estimator with Patterned Concrete®. The park opened in 2013. Skateboarders and BMX riders of all levels enjoy a high drop-in ramp, two custom-textured gang plank entry paths, and almost 500 feet of rails and railings.